Put so elegantly by Aaron Gleeman, the Minnesota Twins have slumped away their lead in the A.L. Central and now, for the first time since April 5th, are not in first place. Poor offense and horrendous pitching is a baseball team's worst nightmare, and the Twins have had both. Other than a couple players, the Twins have been horrendous in a month they usually "get going." The rumor mills have been churning and the Twins have found themselves caught up in the middle of a lot of them. Thanks to a new revenue and high expectations, the Twins have put themselves in position to be "buyers" at this July's trade deadline. But unlike in other years, the Twins have the opportunity to add a legitimate difference maker (which isn't to say the players we've added in past years didn't make a difference). There have been three names that don't seem to be going away: Cliff Lee, Dan Haren and Roy Oswalt. All three of these guys have something in common; they are all pitchers. And not only are they pitchers, they're great pitchers. Why not look for offense? Because good hitters are hard to come by this year, especially if you're comparing them to the quality of pitchers that are believed to be available. Or least that's the way I see it, feel free to disagree. So looking at those pitchers, who should the Twins go after? If it were up to me, my choice is probably the most unlikely. Being a big fan of player development, I don't like the thought of acquiring a "rental" player. If the Twins don't believe they can re-sign the player they require, I don't want to see them give up a lot to acquire them. That philosophy has been the Twins M.O. for years, and it's one I completely agree with. So do I believe Lee is the best fit? Well pitching-wise, yes. He's had success in the American League Central and fits the Twins model of pitchers who have great control. But unlike Oswalt and Haren, Lee is a free agent at the end of the season, which means he'd likely be acquired as a "rental." Could the Twins re-sign him? Maybe, but I think that's highly doubtful with the New York Yankees already salivating about the thought of acquiring him. How about Oswalt? He has two years remaining on his contract and he also has a history of success. But while his contract would ensure that he's here for more than three months, the salary he's receiving is probably a bit much for the Twins to absorb, especially if they're trading multiple highly-touted prospects to acquire him. So that leaves Haren. While he's struggled this season, there's no doubt that he is one of the best pitchers in baseball. 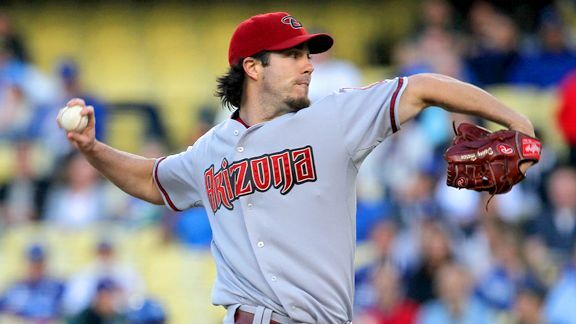 Since joining the Arizona Diamondbacks in 2008, Haren is 37-24 with a 3.51 ERA and 8.7 K/9, which includes his 4.65 ERA. So what makes Haren so desirable? That he's under team control through 2012, with an option for 2013. And the salary? He's making $8.25 million in 2010, he'll make $12.75 in 2011 and 2012 with a $15.5 million club option in 2013. A very manageable price for a very good pitcher. But all of this really means nothing unless you compare the packages that it'd take to acquire each player. The Twins most valuable trading chip is Wilson Ramos, a highly-touted catcher who is blocked by Joe Mauer. But while Ramos is expendable, trading him for Lee should be out of the question. Ramos' potential is too good to trade him for three months of Lee, unless you can guarantee two things: a clause which states, "If the Twins do not win the World Series, we will return Wilson Ramos to them," or a window of opportunity to work out a contract extension. Unfortunately, neither will happen. The most I trade for Lee is Nick Blackburn, Ben Revere and Anthony Slama. I'd assume another team could top that, but I do think the Mariners would accept that if they're that serious about moving him. The Astros already have a young catcher named Jason Castro, who they selected in the first round of the 2008 draft, so Ramos probably wouldn't entice them as a centerpiece. They would probably ask for a package of young pitchers and outfielders, which the Twins definitely have. Other than Kyle Gibson, who is likely "untouchable," David Bromberg is the Twins best pitching prospect. And other than Aaron Hicks, who is also probably "untouchable," (at least in this case) the Twins have Angel Morales, Joe Benson and Revere as young outfielders. And then there's the Diamondbacks. The hard thing about trading with Arizona is that for the most part, they have a very young team, with most of their positions "filled" for the next few years. So why would they want to trade Haren? Because for one reason or another, they're trying to free up cap space, and Haren's their highest paid player. Would Ramos entice them as a centerpiece? With Miguel Montero on the team, you wouldn't think so, but Montero is set to begin arbitration this winter, so they may look to move him to a club with catching needs. But Ramos, of course, would only be a starting piece. On top of him, I'm sure one of the three outfielders I previously mentioned would need to be included, as would a young pitcher. There has been a lot of talk that some of these teams could target Kevin Slowey, Scott Baker or Nick Blackburn in a trade, but since I think the Diamondbacks are serious about saving money, I didn't include any of them in this offer. The only starter that they'd probably be interested in is Slowey, which (for me) would immediately eliminate both Bromberg and Morales from the offer. Mentioning Slowey in trade talks amongst Twins fans is a form of sacrilege, but I have no problem saying that I'd trade him in a heartbeat, if it makes sense. However, I think the Twins would be better-off keeping all of their starting pitchers. What are your thoughts? Should we focus on pitching? Who would you target? How much is "too much?" Feel free to send me an e-mail at jajohnson021@yahoo.com. I think one thing that you are overlooking in the Cliff Lee scenario is the fact that the Twins would recieve 2 first round picks for Lee if he were to walk. I think that either 5-6 years of Lee and a Lee rental are worth more than a Ramos package. Thrylos - it's not just question of talent, but overall value. Ramos/Bromberg/Morales/Slama wouldn't get you Roy Halladay when Halladay had two and a half seasons with a reasonable team option for another. Halladay in that situation was virtually untouchable. I wouldn't necessarily start where Josh proposes, but in the end, that'd be a steep price but a worthwhile gamble. It's important to keep in mind that the Twins would be trading from several areas of strength, too. I suppose it depends on what you value more, the prospects or the money. Yes, it seems like giving up a couple of top prospects for half a year 'renting' Lee (plus the compensation picks) is a lot. But financially, you're only committing $4.5 million (or less, depending on how soon you get him). On the other hand, yes, you could control Haren for at least two more years with an option on the 3rd. But you're also making a total financial commitment of about $33 million (half of this year's salary, his salary for 2011-12 and the $3.5 million buyout of his 2013 option). He hasn't had injury issues so it may not be an unreasonable risk, but he does turn 30 this summer so it's a lot of money at risk for a pitcher in his 30s. Tony, you're absolutely correct. However, my opinion still isn't changed on Lee. He's a great pitcher though. Thrylos, I think you're overvaluing some of the players if you think that package would net Roy Halladay. David, I agree that we'd be trading from areas of strength. If Morales is gone, we'd still have Ben Revere, Joe Benson, Aaron Hicks, Rene Tosoni and Chris Parmelee as highly touted outfield prospects. Jim, I agree that it could be risky, but like you mentioned, he hasn't had major injury concerns that would make me not want to take the risk. I don't think we'll be getting Haren. According to MLB trade rumors, the Twins are on Haren's no trade list. If he doesn't want to be on a winning team like Minnesota, fine. Let's get someone who wants to be here, and help the cause. Let's get Ted Lilly or someone else. Thanks a lot for keeping the blog Lively with such interesting blogs. Nice stuff you got,very well written and interesting to read. Thanks for this nice post,interesting to read.